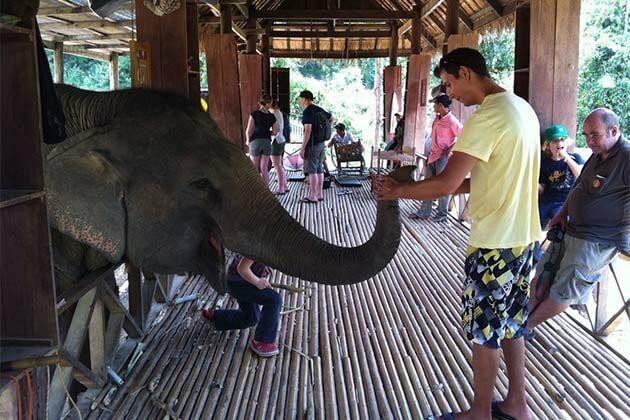 Though Laos is a landlocked country, “the land of a million elephant” still is affectionate by “the Nature Mother”, go trekking through the thick forests or dip yourself in the cool water under the specular waterfall, all of the things you can do in the Khong Island. One thing, I’m sure with you that if you travel to Khong Island, you don’t want to come back home. So, What makes Khong Island become wonderful like that? 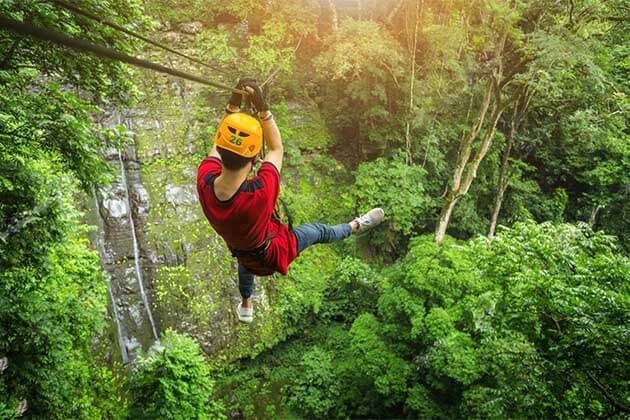 Go Laos Tours and let’s explore together! Khong island or other name is Dong Khong is the largest island in Si Pha Don at Mekong River. 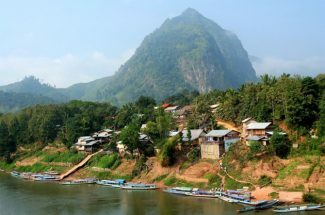 Although Laos don’t have sea, here is regarded as the small beach in Laos. the island covers approximately 144 sq km2, Khong Island is noted for its natural beauty and is a growing tourist destination. 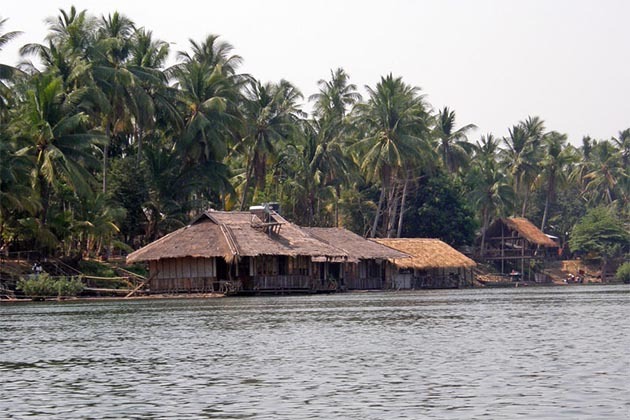 Khong Island has also become the home of nearly 60,000 people living in the two main villages Muang Sae and Muang Khong. One of the special points which makes Don Kong is different from other islands, there are some hills rising above sea level, which makes the view of the island more idyllic. Most of the famous areas in Laos owns the museum at that place, and Dong Khong is too. Dong Khong History Museum is an ideal place to gain more knowledge about the islands. It’s two – story hose which was built in Frech colonial style by the local government Kou Abhay in 1935. It is called the Brick House or Sathannavoudthi which means Garden of Eden by some villagers. The first floor is the place where you can get information about the history of the island, houses, and families and see the traditional instruments. The upper one is used to display the original furniture. It’s really interesting and worth your time. Sited in the hilltop temple overlooking the Mekong River in Ban Muang Saen Nua, Wat Phou Kao Kaew is a famous temple in Dong Khong. 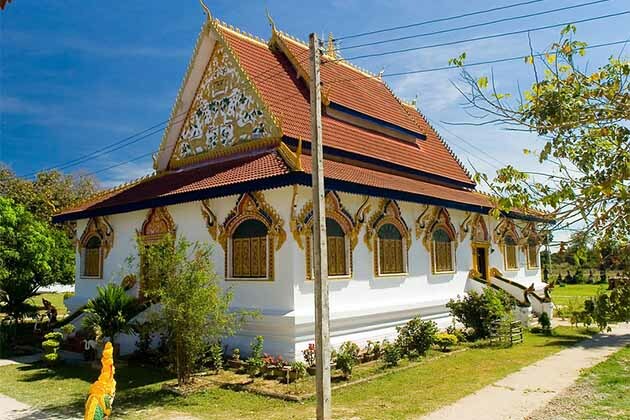 Visit the temple, you will back to the past due to the pre – Angkorian stone line which is put at the base of the stupa. Additionally, the temple with its honor displays the stunning carved wooden deities in which some of them were found in the downriver and used to ornament the ledges. There is a legend from the locals that this temple becomes the home of a naga since an entrance might lead down to the lair of this creature. From far away, you can see a gold Buddha lies on the top of hills. Besides Wat Pha Kaew, you can visit Wat Chom Thong and Tham Phou Khiaw, a small cave which has the Buddism in the Green Mountain are also available for you to visit. When you come to Dong Khong, don’t miss the local market in Muang Khong where you can see the fresh fishes in the pots and the local’s products such as palm sugar, Palm leaf hats, and Lhao Khao Gum – potent alcohol, displayed in the store. The seller is very friendly if you are a foreigner, you can buy the cheapest price, even they can give you more. 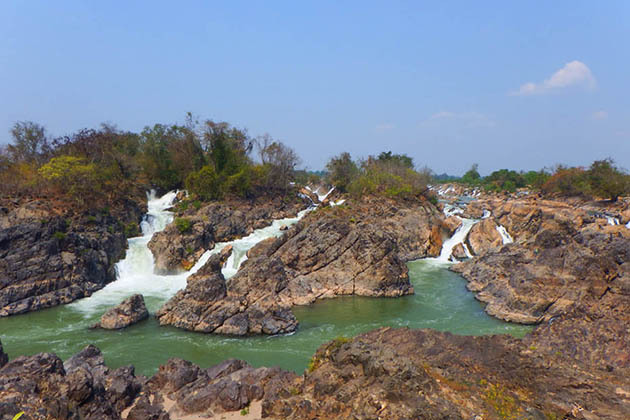 In fact, the Khone Falls and Pha Pheng Falls located in Champasak Province on the Mekong River, near the border with Cambodia. Known as the largest fall in Southeast Asia, the Khone Falls always attract the tourists whenever traveling in Dong Khong. The falls are characterized by thousands of islands and countless waterways, which makes its name the 4,000 islands. The country life in Dong Khong villages is the same with other villages, really slow, which offers the visitors the chance to have a meaningful cultural experience and get a better understanding of the Laotian’s daily life. 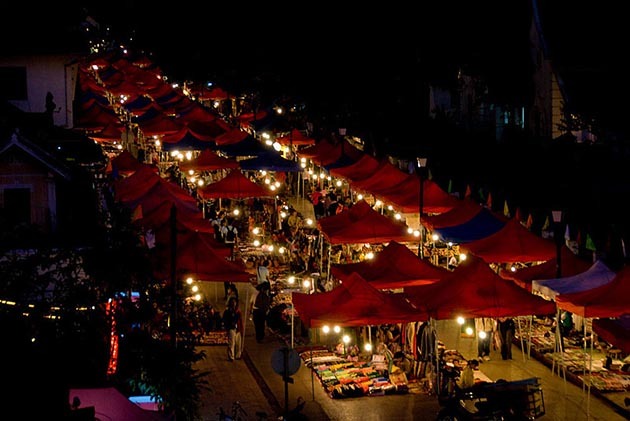 Therefore, the villages are always listed on many tours in Laos. 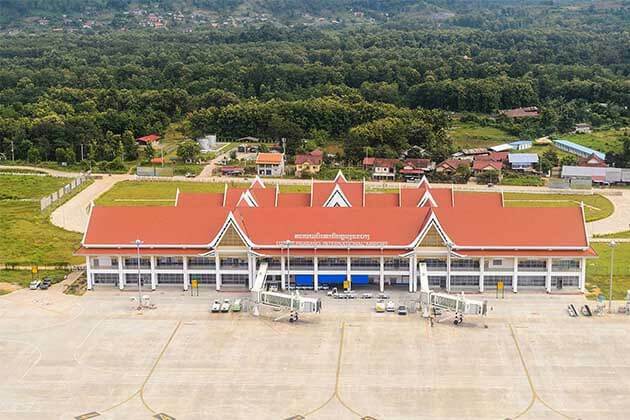 you only can find the feeling of hustle and bustle in the port towns of Muang Khong and Muang Sean where accommodation, cafes, and shop are located. Go deeply into the villages, you can see the large rice fields, the green forests, and the rolling hills. Under the shadow of big trees in the forests, you can see some houses where you can take short cycling tours to explore the local life, it’s amazing to see the chin of villages lining to form the South Loop. Riding on the narrow path or along the trails which snake between the bamboo forests, feel free to enjoy the local cuisine and contemplating the traditional wooden houses painted white and blue colors might be your memorable experiences when spending your time to visit both loops. 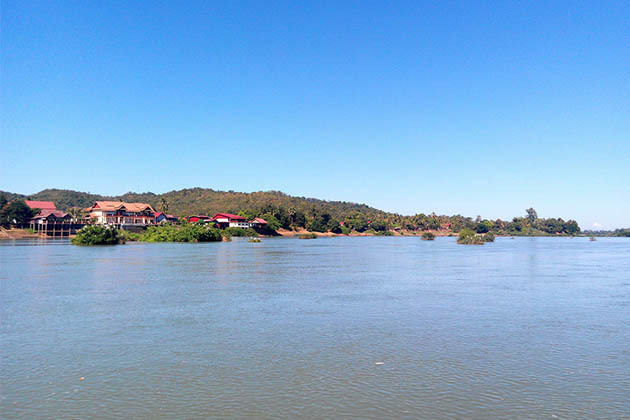 Overall, Khong Island is the best place you should go if you travel in Laos. Visit the wonderful waters, the temples, or explore the slow local life sure that make your trip in Laos become more meaningful. Come to Khong Island to find something which you may lose in this hurried life.